I dont’ know about you, but I like my comfort. Maybe it’s because I’ve worked for nearly 30 years or maybe I’m just blessed to have lived in this wonderful country. . . We are able to have accommodations and sustenance which make our lives more comfortable. Recently we have been buying, making or having made things to add to Gilraker which will make it more comfortable or easier to live in while we have her. 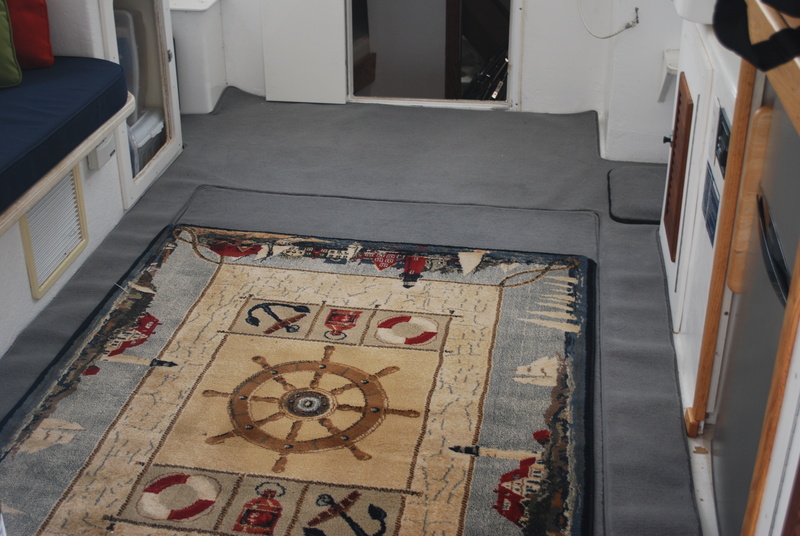 As you can see there is new carpet and a nice nautical rug. We’ve had the settee cushion replaced and a dark fabric covering for it. 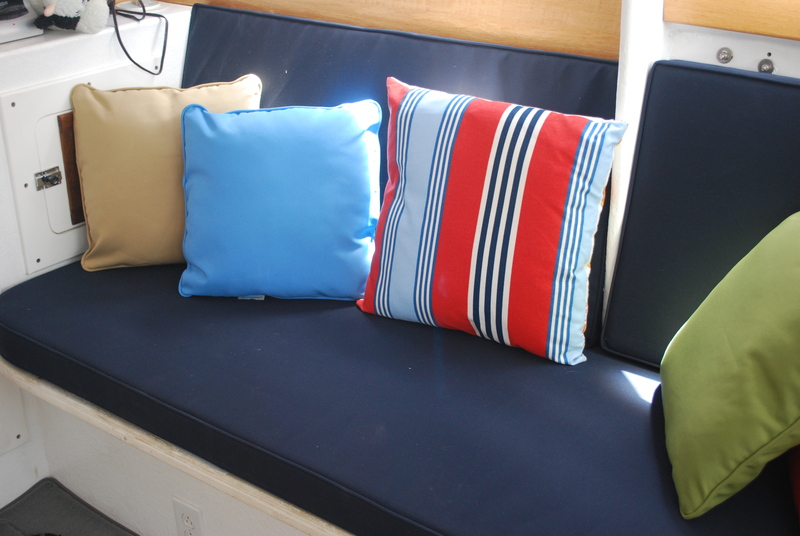 WE found colorful pillows for the settee also. We like the bright colors! What do you think? We have purchased some nice dishes, pots and acrylic glassware for the galley too. Then we had mattresses made. They look great. I anticipate a really good night sleep aboard on those! And we purchased sheets and a cover for them too. We hope to modify them to make for easy making of the beds in the mornings. I’ll get photos of those another day. Oh and she now has a new cover for her front windows too. 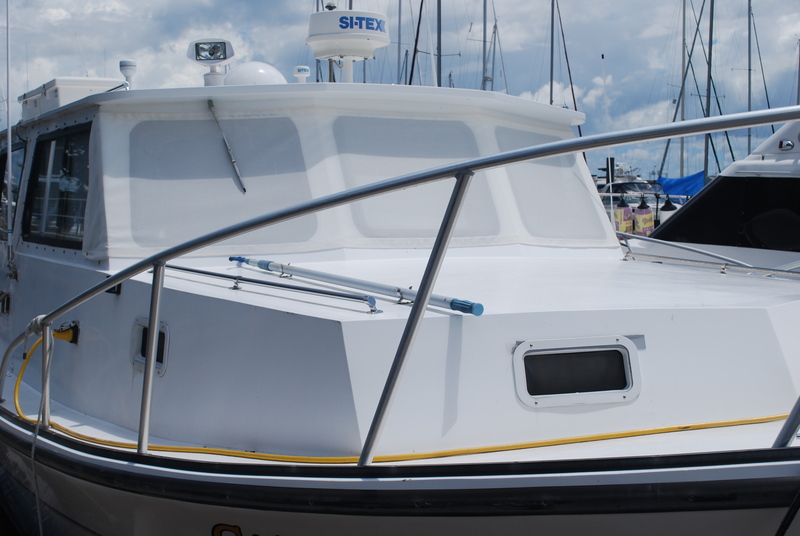 It should keep her cooler while we are docked or anchored out. And will keep her a bit more private at night too! new “Shades” for GilrakerSo as you see we are slowly making her ours as we can afford to. . . paying as we go is the way to be these days! Thanks for reading. . . . Fair winds and following seas. . . .